These opinions have changed little in recent years. 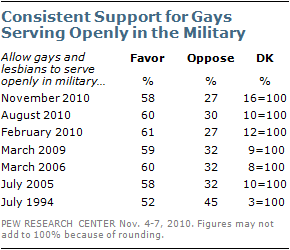 Since 2005 – including three surveys this year – roughly 60% have consistently favored permitting homosexuals to serve openly in the military. There is greater support for permitting gays to serve openly today than there was in 1994, after President Clinton put in place the “Don’t Ask, Don’t Tell” policy. 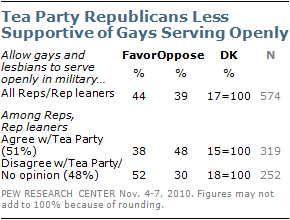 In July of that year, 52% said they favored allowing gays and lesbians to serve openly in the military while 45% said they opposed allowing this.